Grand is the newest smartphone of Samsung Galaxy Series. It comes with an impression of low-budget smartphone and similar to Note 2. Now, Android lover’s can also enjoy 5-inch screen of Galaxy Grand. Let’s compare with Samsung’s Galaxy S2 in terms of hardware and software. Both phones have separate market of user’s but it’s worth to compare them. 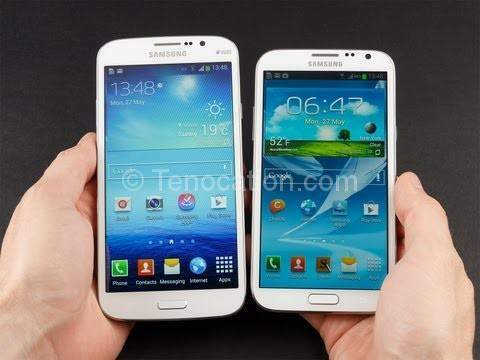 Where comes the screen then Galaxy S2 AMOLED screen is far better than Galaxy Grand. The most impressive parts of S2 was it’s 4.3 inches WVGA Super AMOLED Plus screen display. Though it looked little pale every time, picture quality was crisp and colours were vibrant. Grand’s 5 inch screen offers just 187 ppi which is just average. Galaxy S2’s display offers same resolution of 480 x 800 pixels with better 217ppi. AMOLED screen of S2 beats the Capacitive touchscreen of Grand. You could easily separate one pixel from another which confirms that the display is not up to the mark. If picture clarity and colours is what matters to you the most, go for galaxy S2 or if you are a fan of bigger screen, Grand will be your choice. Both phones is powered by 1.2 GHz dual core processor. Galaxy S2 has Mali 400 GPU to support its processor. Though there is no much difference in terms of processor, Grand comes with out of the box Android Jellybean 4.1 which is much better than ICS packed with galaxy S2. Samsung yet to provide jellybean update for S2 which means Grand gets clear edge in terms of Operating system. Grand is the second jellybean phone from Samsung after Note 2. Where come’s the name of design, our pick is definitely Galaxy S2. It’s slim and very light phone. On the other hand, Galaxy Grand’s bigger screen is definitely hard to hold. In spite of the fact, that both the phones have ‘plastic’ look, Grand carries premium look with itself which can not ignored. Galaxy Grand is little heavier to hold but it looks better in hands while comparing with S2. One outstanding feature of S2 is it’s internal 16 GB memory as compared to Galaxy Grand 8 GB memory. It’s quite amazing for Android lover’s that Galaxy Grand comes with a cheaper price than Galaxy S2. The major feature of Samsung Galaxy Grand is 8MP back camera with a secondary front camera of 2MP, 5 inch screen and still cheaper than the current price of Samsung Galaxy S2. No doubt that Galaxy Grand win’s when we talk about affordability. I personally wanted to share this specific posting, “Compare Samsung Galaxy Grand vs Samsung Galaxy S2” with my buddies on fb. I personallyjust wanted to distributed ur remarkable posting! My wife and i got so ecstatic Jordan could finish off his reports with the ideas he gained from your web pages. It is now and again perplexing to simply continually be making a gift of guides which people today have been making money from. And we also acknowledge we need you to be grateful to for that. Most of the illustrations you have made, the straightforward site navigation, the relationships you assist to promote – it is most fabulous, and it is assisting our son and the family know that this theme is awesome, which is wonderfully vital. Thanks for all the pieces!